Our Maui home is located steps from the beach. Enjoy your time in a home away from home! This private suite is quiet and peaceful, and was newly renovated in December 2013. 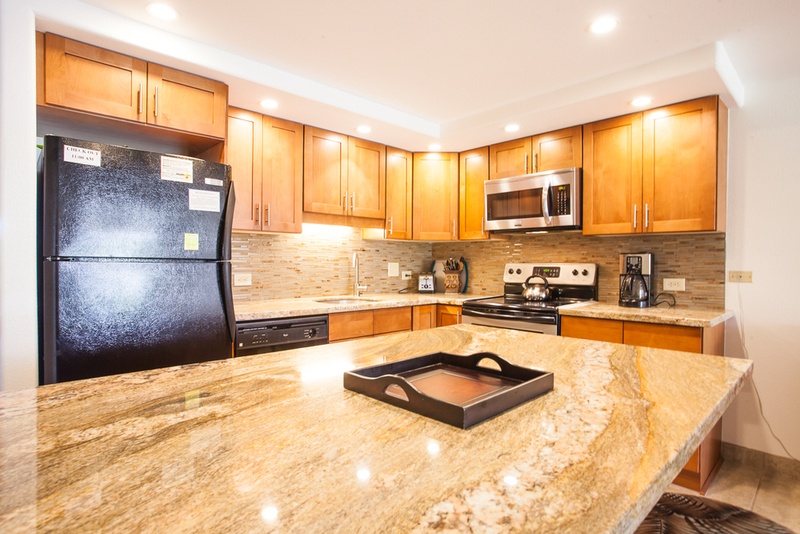 It features beach-friendly tile and granite countertops throughout. The kitchen is unlike anything you've seen in a vacation rental. Not only does it have all new appliances (fridge, microwave, range, dishwasher, etc), cherry cabinetry, and plenty of countertop and seating space, it's fully stocked for cooking delicious meals. You'll find a full range of dish ware and utensils - mixing bowls, pots and pans, cutlery, serving spoons, knives - as well as cupboards stocked with basic herbs, spices, and condiments, making it easy to prepare delicious meals. Our lanai is another beautiful feature: it's 166 square feet of relaxation - most of the other suites in Kamaole Sands have lanais which are only 66 square feet. Many of our guests choose to take their meals or have their morning coffee at the lanai table. It's fairly quiet and private throughout the day, so suntanning is also an option. The lanai storage is full of everything you need to enjoy the beach & water sports, saving you hundreds of dollars in rentals. be sure to check our lanai storage space for snorkelling gear, boogie boards, beach chairs and umbrellas, children's toys, and more! The beach is only a 4 minute walk away.